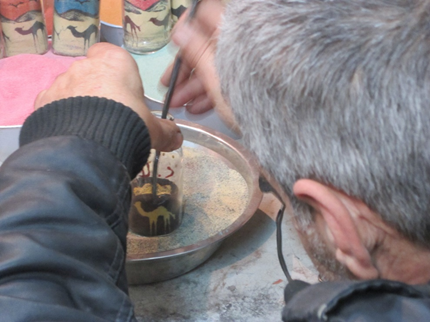 Abu Saad creates art works in bottles of colored sand and is always ready with a cup of coffee and a story. Several years ago, Abu Saad went to Jordan to teach them how to fly commercial airplanes. He learned that Palestinians are not allowed to do that; but, as he says, “That’s not the first time a Palestinian has experienced difficulty”. He looked around for something else to do and became fascinated with creating art work in bottles of sand. However, he learned that current craftsmen only teach the techniques to family members. Once again, he “experienced difficulty”. Later the King of Jordan visited in the south and also became enamored of sand art. He decided that the techniques should be taught in a university course so that desert sand could be transformed into gold. With that, Abu Saad enrolled for the two-year course. With his new skills, Abu Saad returned to Hebron six years ago. He remembered the vibrant commercial life of the Old City souq of thirty years before. Much had changed, many of the shops were closed, and few people wandered the streets that used to be so crowded that you might wait ten minutes on a busy corner before being able to enter. He found a small, empty shop and began creating. 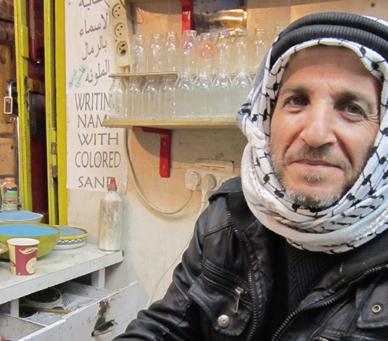 Being the only sand artist in Hebron, he hoped his shop would help draw people back to the Old City souq. Watching him work, one is amazed by the speed with which Abu Saad can create a troop of camels marching round the base of a bottle, fill in the mountains in the background, add some birds in the sky and pack the sand so tight that none falls out when he reverses the bottle. Abu Saad sometimes creates bottles with company logos. He once received an order for 600 bottles from the local Coca Cola company when it celebrated its 15th anniversary. They had some ideas, and he added his creativity to make bottles with a Palestinian kufiyah design in the bottom and the Coke logo in the middle, all in a small Coke bottle supplied by the company. That order took about a month to fill. During one Tour of the Old City, an Israeli settler knocked a row of Abu Saad’s bottles onto the floor breaking several, but that only happened once. Thereafter, some of the Internationals monitoring the Tour provided a protective presence at his shop. Abu Saad combines a commitment to his art and to his community. Why did he come back to the Old City and its empty shops? Because he was born here, he would like to see the Old City thrive again, and he wants to die and be buried here. Such is the rootedness of the Palestinian people.